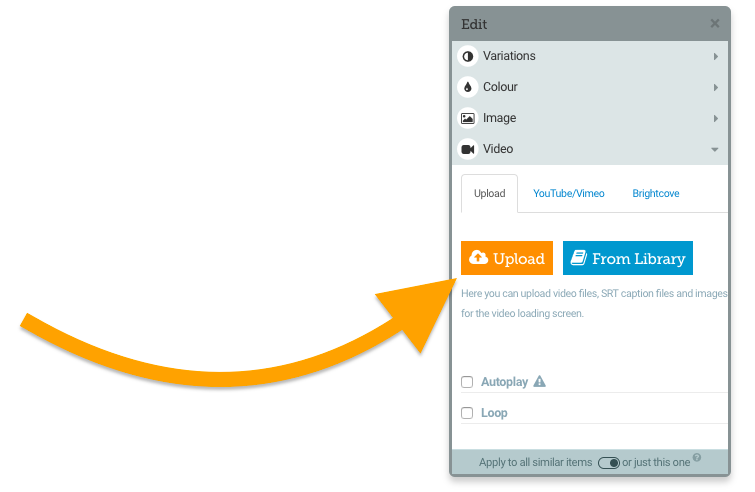 To import a video, first open a ‘Video’ Page type, or add a ‘Video’ part to your page with Layout designer. 💡 Pro Tip! 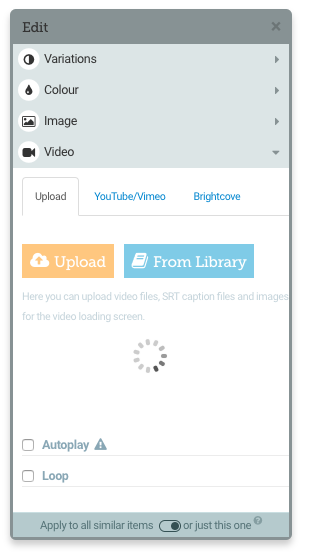 You can also drag your video file onto the ‘Upload’ button. …Elucidat will now encode your video so that it works smoothly on mobiles and tablets (this is called Variable Rate Streaming). Elucidat supports video files of up to 40mb, you can upload MP4, MOV, M4V, if your file is larger than this we recommend compressing the video before uploading. You can also make your audio files play automatically for users on Desktop computers with the ‘Autoplay’ toggle. 💡 Please note: Due to a Chrome update, learners will only experience autoplay if they have frequently interacted with media on your LMS or the the direct Elucidat links. This article provides more information about Chromes current guidelines.